I attempted to enter the UK through London and was asked some personal questions that really triggered me and I just answered them very vaguely and evasively because they made me feel uncomfortable and felt intrusive. They cited concerns about my finances in the refusal letter even though the details they cited were simply incorrect. I was detained for some hours, my biometric profile thoroughly taken, and then removed on the next flight back to the USA with the below stamp in my passport. I then researched my options and determined that my best bet would be to retry my luck with another entry attempt and if it failed then apply for a formal prior Visa. I thought it would be best to undertake all this from Ireland so I flew to Dublin and upon arrival I hand over my passport and the Irish border agent gave me a dirty look and asked me what went wrong in London. I explained and showed him the refusal of entry letter, and then he grilled me for two hours about my finances. Finally he was barely satisfied (I love the Irish) and granted me entry to Ireland for 2 weeks (standard for US citizens is 90 days) and let me in. 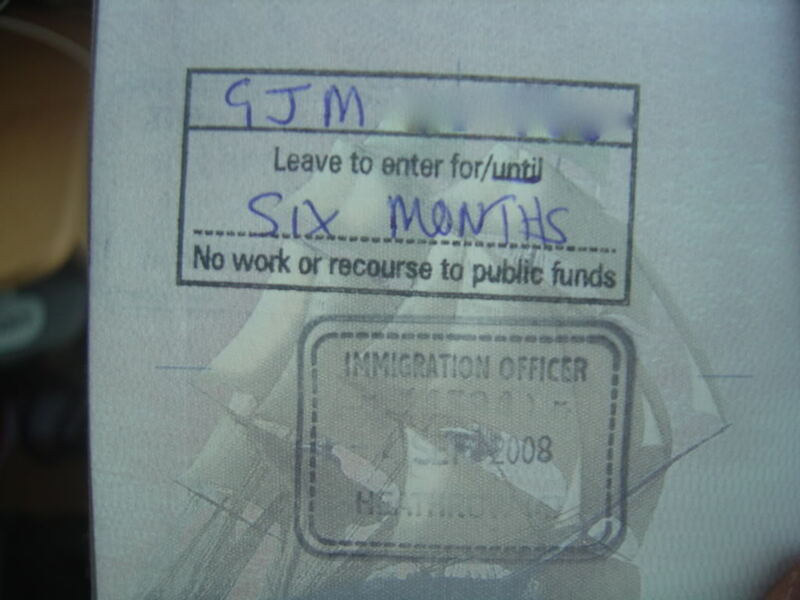 I took a ferry to the UK and upon reaching the British port had my documents inspected by a UK border agent who neglected to stamp my passport but cordially granted me entry, what I assume was a standard leave to enter, equivalent to a 6 month standard visitor Visa, prohibiting me from working or recoursing to public funds. My question is mainly which part of the pictured stamp indicated to the Irish fellow that I'd been refused entry, and should I expect that to cause me problems crossing other borders in the future? Further, would changing my name and replacing my passport avert these problems? 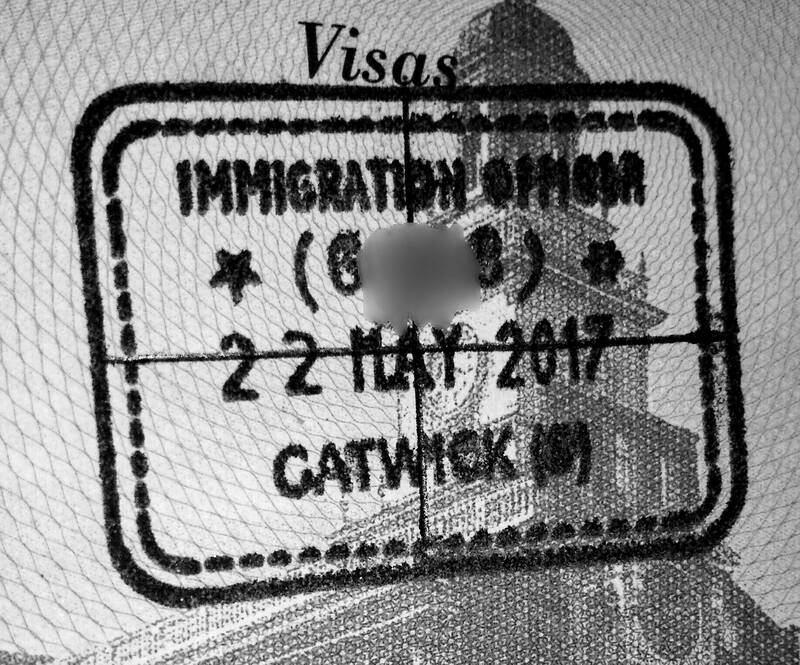 Immigration information is shared between the UK and Ireland under a bilateral agreement, but the most obvious clue are the black lines stamped over your UK immigration stamp. The UK uses that cross symbol to indicate someone has been denied entry. That symbol is not present on an ordinary admission stamp. Your biometrics have been recorded, and they know who you are. It is possible that a new passport would help avoid questions from immigration officials in other countries who see the stamp, but changing your name to avoid suspicion by UK border officials is not a recommended strategy. The best practices recommendation for a visa-free national who has been refused admission is to apply for entry clearance before traveling. You, of course, risk rejection, but a granted entry clearance will give you an extremely high chance of a smooth border crossing, short of suspicions of fraud or a warrant for your arrest. And it is easiest to portray yourself in the best possible light by submitting all your documents at home rather than scrambling to provide proof of funds or employment after a long overnight flight. I would add that evasiveness is not the best strategy for a border crossing. The questions can, indeed, be quite personal, and I recognize the situation was emotionally difficult for you, but failing to answer will cause them to wonder what else you're hiding and is unlikely to result in a successful outcome. Because the UK and Ireland operate a semi-open border agreement called the Common Travel Area (CTA), Ireland has the option to refuse entry to persons with a British refusal stamp, as Ireland could be used as a backdoor to get into the UK (which is what you successfully did). As for changing identity/passport, that is now useless seeing as your fingerprints were taken, and are shared within the CTA. And finally, for the future, as the other answerer says: stop thinking in terms of "too personal". As a non-EEA national you're completely left at their mercy, and in order to increase your chances of entry, you should answer any and all questions clearly and truthfully even if (theoretically) they're about private aspects of personal relationships. Not the answer you're looking for? Browse other questions tagged uk customs-and-immigration us-citizens ireland or ask your own question.